The death of Thomas Crowder aboard the RICHARD AND BENJAMIN (Captain John Whitty) at two o’clock in the morning of January 28, 1653/54 both ended and began a search for my ancestral arrivals - and perhaps those of others. For some time, data on the arrival of my maternal ancestor, Thomas Chevers, founder of major lines of Chevers/Shivers families in Virginia, Maryland and New Jersey, had proven elusive. His name could not be located in any of the major sources of immigrants. Reviewing an index of wills from Lancaster County, Virginia, it was with some weary interest that I noted a Thomas Chever/Chivers had been witness to the non-cupative will of one Thomas Crowder. What the actual record revealed was quite exciting. "These are to certify to all those whom these presents may come that we whose names are hereunder written are and at all times to testify upon oath the truth of this last order desire and will of Mr. Tho: Crowder who departed this life ye 28th of January 1653 Viz that about two o’clock of the morning ye sd Tho: Crowder being very sick and weak desired Capt John Whittey comandr of the ship Rich & Benjamin in which ship ye sd Crowder then was to come unto him with ye sd John Whittey & presently did & then & there in the presence of us Tho: Chetwood Mercht Tho: Chewers Chirurgeon Robt Osborne Carpenter & Wm Moulte planter in Virginia ye sd Th Crowder did will and order ye sd John Whittey to be pleased to oversee and dispose of all ye goods whatsoever belonging unto him aboard ye ship Rich & Benja & otherwise gave him power to receive all debts oweing unto him in ye country of Virginia & to manage all his affairs there & to return & ansr thereof to his excrs in England ye sd Crowder willing that what goods were returned to England should be equally divided amongst his brother’s & sister’s children. For witness whereof we have hereunto set our hands this 29th of January 1653. "Whereas Tho: Crowder, Marcht, passenger aboard Capt. Whittey’s Ship died & in his last Will & Testament willed yt Capt. John Whittey Comander of ye Ship Richard & Benjamin of London should dispose of & return for England to his kindred mentioned in his Will his estate on boarde ye sd Ship & alsoe all debts due to him in Virginia And Whereas Capt Jno. Whittey doth peticon this court yt: comission of Administration may be granted to him on ye sd Estate wch: ye Court hath accordingly granted unto him he puttinge in security etc." "Whereas Syth Hayward Juner aboard ye Richard & Benjamin of London died intestate & whereas Capt. Jno: Whittey Comander of ye sd Ship out of a tender care of his widow & Orphants hath peticoned this Court ye Comm. Of Administracon on ye sd deceds Estate wch: ye Court hath accordingly granted him, he puttine in security &c."
This was exciting news, indeed. Not only did it give a strong indication of the ship, arrival date and fellow passengers for Thomas Chevers, it also gave a vivid picture of the times: two deaths on the same voyage could not have been unusual. Of the persons mentioned in the court proceedings, some basic facts are known and may be of interest. Thomas Chetwood, whose wife’s name (Elizabeth) we know from her involvement with a land patent from Will Borksly in 166311, was very active as a man of property. Much of his business appears in Old Rappahannock County, Virginia, as well as in Lancaster County12. Was his wife aboard the RICHARD AND BENJAMIN? We don’t know as of this writing. In reference to my ancestor, Thomas Chevers, as will be noted in the next segment, THE SETTLING, he appears to have traveled with his wife and at least four children: Thomas, John, Petronella and Elizabeth. A fifth child, William, was born in Virginia. It may be presumed that Thomas set out with a similar equipage, if not retinue. He preceded his brother into exile only by days. He never returned to Monkstown Castle, his birthplace, nor to Ireland at all. While Thomas Chevers’ occupation was listed as chirurgeon (surgeon) on his landing, no record exists of him studying at any of the known medical schools of the day. While an archivist at Trinity College, Dublin, stated that it was likely he studied with a physician rather than in an academic setting19, there is no record of Thomas practicing as a surgeon in Virginia. By all accounts, he became a landowner and practiced husbandry. The confiscations of Cromwell had stripped most Anglo-Irish of their lands and titles.20 There are indications that Thomas had held land near the old Wexford property in the Barony of Bargy, Ireland. There is record21 of "Forfeiting Proprietors, In Ireland, Under the Cromwellian Settlement - Commencing A. D. 1657," which finalizes the acts of Cromwell, and which includes the following members of the Chevers family [under the alternate spelling, Cheevers]: Barony of Forth: John Cheevers, George Cheevers, Esq. [also listed as George Cheevers] ; John Cheevers; Marcus Cheevers, Esq. [also listed as Marcus Cheevers]; Richard Cheevers. Barony of Bargy: John Cheevers, Esq. [also John Cheevers], Maystowne, George Cheevers, Esq. [also George Cheevers] , Thomas Cheevers, Arthur Cheevers. This listing also includes several members of the Whitty family, including Nicholas Whitty, Richard Whitty, Esq., and Richard Whitty, the Younger. "For and in consideration of two good Young Cowes to be such as shall be chosen by me Ralph Creed out of ye whole stocke of Tho: Chiffers his cattle upon demand as also for ye payment of ffower Thousand pounds of good Tobacco and Corke payable 10th of October next and foure thousand pounds more of like tobacco and Corke to be paid the 20th day of October thence next comeing which shall be in ye year 1660 I the said Ralph Creed have bargained and sold unto Tho: Chiffers. His heires and successors for ever Eleven hundred and odd Acres of Land At ye head of Sunken Marsh neare upper Chippoakes in Surry County which was lately in ye Occupation off Richard Hill and sould unto mee [sic] the said Ralph Creed by Geo: Jordan by order of Court and alsoe by ordr of ye Grand Assembly...to be held by ye said Tho: Chivers...ye sd Ralph Creed Doe further ingoiyn my Selfe to Deliver unto ye sd Tho: Chivers or his assigns A pattent for ye said Tract of land in his and there owne names upon reasonable demand And a witnesse of ye truth hereof as also to binde me...to ye true and faithful performance hereof I the said Ralph Creed for my Selfe and them have hereunto Sett my hand and seale ye 20th of May 1659. Sealed Signed and Delvd in ye psence of Ralph Creed his black wax marke R Tho: fflood Christ CL Lewis, Acknowledged in Court by Ralph Creed et uxor." Records on Thomas Chivers in the New World are scarce, but he obviously prospered. It is apparent from the deed quoted above, and from the lack of evidence of surgical practice, that Thomas had come to this country equipped much as his brother Walter had been for Connaught: with family and possibly livestock. Or, he may have expected to use the arrearages for service which might have been anticipated [after his migration] under Charles II, if collected, to purchase the livestock. The intent would have been logical: To start a new life and, as the second son of a second son, to make a better place for self and family. There is indication that Thomas maintained correspondence with his brother, Walter. It appears from the record that Walter’s oldest son, Walter Chevers, Jr., set sail for the New World apprenticed to one Richard Homewood "[1 August 1661] The following apprenticed in Bristol: ... Walter Chivers to Richard Homead, 4 years Virginia. "25 The Homewoods were neighbors to Thomas Chevers in Surry County26, and to his son Thomas in Maryland27. Some idea of Thomas's way of life in the New World can be gleaned from elements of his will quoted by his son William in various land conveyances. An example is the conveyance of the old Ralph Creed land, the last family homestead, to Benjamin Harrison on 6 October 1691, which mentions that the land is sold with "houses, orchards, gardens, woods, ways and waters, with free privilege of hunting, hawking, fishing and fowling. "28 The phrases well describe the lifestyle of a 17th century landowner. The mention of orchards is especially important, as orchards represented an attempt to diversify from the staple money crop, tobacco. It should be noted that Thomas’s grandson, John Shivers of Maryland, in one lease of land was charged with setting out an orchard (1701 lease from John Cross of Anne Arundel County, Maryland29). Likewise, Thomas had wisely chosen to engage in some degree of animal husbandry, since cattle were also in rare commodity: hogs were the more staple livestock. His son, John Shivers, became a butcher. We the Subscribers to this Verdict being impannalled as a Jury by Order of the Isle of Wight Court dated the 9th June 1658 in a difference between Major Nicholas Hill Plt and John Snellock Deft to see the Patent for Land which Major Hill bought of Col. Bernard wholy Surveyed, Have in Obedience to the sd Order wth much Care and Pains observed the Surveyor to perfect and compleat the same according to Patent to ye utmost of our Knowledge & Judgments and to Satisfy that the Surveyor Thomas Woodward following the Head Line of the Mile upon the Land on James River formerly belonging to Mr. Justinian Cooper came ypon John Snelllock’s Land wthin two Chains or thereabout of ye Northernmost Branch of Pagan Creek which part the sd Snellock’s Land and Edward Prince and so along the said Branch as it runs upwards towards Mr. Charles Barocrofts to a Corner Tree of the said Coopers and from thence along ye Swamp to ye marked Tree of Ely and Pantios and to the Mill Dam and so down the Swamp to ye head of Lawnes Creek and so along the Land of Robert Lawrence to ye said Lawrences corner marked Tree joyining upon Coopers Line ye Computation of the whole patent of Col. Bernard’s Land according to Mr. Thomas Woodwards Report to Us being Nine Hundred Acres including therein all the Housing & Land as abovesd that the said John Snellock now lives upon which we do find to belong to the said Major Hill according to the Survey made by Us and Mr. Woodward. AS WITNESS our hands this 28th day of July 1658. Following the restoration of Charles II to the throne, Thomas's uncle in Ireland, John Chevers, Chief of the Name, applied for and was eventually restored to some of the Chevers land, most particularly, the land at Killyan.31 Thomas made no effort to return to Ireland. He must have been satisfied with his lot in the New World he was helping to construct. Thomas Chevers the Younger appears to have been born in Ireland approximately 1643 - 45, based on the ages of Elizabeth and William and estimated age of John by the New Jersey lines.39 He accompanied his family to Virginia aboard the Richard and Benjamin. Thomas would, at age 19 to 21, have been of more than sufficient age to conduct his own business at the time of his father’s death. We have only bare hints of Thomas Chevers/Shivers’ stay in Maryland. He appears in a variety of settings, but seems to have settled primarily in the area of Anne Arundel County, Maryland, after working off or paying off his debt to Benjamin Rozer. He may have returned to or retired in Virginia. He may have inherited land from his father in Nansemond County, Virginia. His occupation was probably planter. He may have married one ______ Griffen. In June 1663, Benjamin Rozer claimed acreage for importing Thomas Chevers. His demand exhibits one of the first usages of the transformed name "Shivers" from Chevers. There is some indication that Thomas the Younger may have also been in possession of land in Surry County at this time: Land in Southwarke Parish, Surry County, possessed by Jno. Griffen and Thomas Shivers appears on the Surry County Titheables of 1700, 1701 and 1702, "above the Stonyrun." While Thomas’s younger brother, William, had a son Thomas and had lived in Surry County until about 1695, the only record of this nephew of Thomas the Younger receiving land was in 1725 when William Shivers gave by deed of gift land in Nansemond County to his son Thomas.44 By 1690, William Chevers was doing little business, if any, in Surry County. Thomas and his brother William may have shared land in Nansemond County. There a Thomas Lawrence [the Younger?] was possessed of land bounded by Thomas Shivers  and William Shivers .45 However, given his penchant for selling or alienating his land, it is more likely that William inherited his brother’s land between 1717 and 1725. The fact that William did not convey land in Nansemond County to his son until 1725 would indicate that the Thomas of 1717 was his brother, though this is not proven. Because the land passed from Thomas to William, however, it is far more likely it was from brother to brother than from son to father. Especially since later William was to sign some of the acreage over to his son. Other indications that Thomas the Younger returned to Virginia, are that his son, Thomas III appears in Rappahannock County, Virginia in 1685, indicating Thomas himself may have actually had interests in that colony on or before that date. This activity gives us an estimated date of birth for Thomas the Younger’s son, Thomas (1668) and indicates that he was married about the time the average indenture ran out - four years. Having arrived in Maryland on or before June of 1663, his indenture would have cleared by or before June of 1667. If he received monies from his father’s estate, he may have purchased his freedom somewhat earlier. This gives us a date of marriage no later, probably, than June of 1667. Additional records indicate that Thomas Shivers III inherited the land near Welch and Cross and either bought out his brother’s share or was sole heir of the land and plantation with John receiving monies directly from the estate. The records of Anne Arundel County show a Thomas Shivers in possession into the 1740s.48 Since no will has been found either directly or by reference, chances are Thomas inherited the land "as heir at law of my father," in the words of a later descendant, thus dispossessing his brother by the law of primogeniture. The records also show the continuing ambiguity of the name Chevers as it changed to Shivers. Petronella Chevers/Shivers would have been born approximately 1645-1647, based on her brothers Thomas’s and William’s dates of birth. Thus she was of more than sufficient age to either choose her own guardian or to conduct her own business. Born 1645-6, she would have been about 18 when her father died. Born in Ireland and accompanying her parents to Virginia, Petronella left home at about or before the time her father died, and settled in Calvert County, Maryland. She was an astute business woman in her own right and of considerable personality. She appears to have joined the Quaker movement in Maryland, during the time of that church’s growth there. Petronella was either married or deceased by October, 1681. "Edward Dorsey demands land for transporting Peternell Chives Nathll Dalton William Grimes Joyce Grimes Edward Batts Sarah Booker Edward Armour. Phillip Calvert. "Warrant then issued in the name of Edward Dorsey for three Hundred and fifty acres of Land due to him for the transportacion of seven persons returnable the vijth August. Petronella appears earlier in the rather touching noncupative will of Thomas Darling, December 1665. "The last will of Thomas Darling verbally delivered by him as by the oath of John Martin taken before William Groome one of his Lordsps Justices of Peace in Calvert County by order and Comission under the Lesser Seale from the Liet Generall which is as followeth. "John Martin aged Eighteen years or thereabouts Saith Mrs Becworth asked Thomas Darling who he would make his Execr if in case he dyed. Thomas Darling replied unto Mrs. Becworth whether he might not make man or woman his Execr and Mrs Becworth Said yes any one that he made Should Stand and he the Said Thomas Darling did reply unto the Said Mrs Becworth that Peter Nell Chivers should Injoy his Estate and Mrs Becworth asked whether She Should take all and Pay all and he replied I and Thomas Darling did give Two thousand Pounds of Tob. And his Iomer unto Mrs Becworth. Swore before me this Seventh of Decemr 1665. "I Thomas Darling being a liver in the house of Guy White Neighbours Comeing in Seeing John Brimston to be very weake asking of him why he did not sett things to right the old man being Sensible at that Time did desire that Guy White Should take all and pay all, and further saith not. Calvert County was a hotbed of Quaker activity in Maryland. "The chief accomplishment of George Fox’s labors in Calvert County was that he succeeded in establishing toleration for the Quakers, enabling them to become permanent settlers. "The largest settlement of Quakers established in Calvert County was on the Upper Cliffs, extending from Plum Point to Parker’s Creek. The Quakers held meetings at the home of John Gary, and later at the home of Richard Johns...Richard Johns settled in Calvert County about 1670...Other Quakers of this community were Francis Billingsley and his brother Thomas Billingsley, Francis Hutchins, John Hance, William Harris, Robert Freeland, Thomas Talbot, and James Dorsey. Elizabeth Shivers was born no later than 1650 in Ireland, since she chose her own guardian at the death of her father. Records of this young lady are very scarce. Elizabeth Shivers, born 1648-50 in Ireland, and accompanied the family to Virginia. She was taken in by her guardian in Surry County, Virginia at the death of her father. She may have married one _____ Blythe, and was deceased between May 1680 and October 1681. There is little else known of Elizabeth. She may have been listed ignominiously as the servant in William Carpenter’s household in the tax lists of 1678 who appears as Elizabeth Blyth in that household in the tax list of 27 May 167958: Elizabeth Blyth is still in the Carpenter household in the tax list of 22 May 1680, but does not appear again after that.59 Titheables were persons aged 16 or older [male] or 18 or older [female]. By 1678, Robert Cartwright was deceased, and her brother William Shivers was a ward of Mr. Carpenter. It is noted that following the death of Robert Cartwright in 1676, on March 28th, "Wm Shivers hath made choyce of Jno Orchard for Guardian, who is to appeare at the next Cort & bring Security for the said Orpts. Estate," but that the guardianship was given over to William Carpenter without full explanation as to why John Orchard was not selected or suitable.60 Quite possibly, Elizabeth being with William Carpenter, it was deemed more appropriate for her brother to be with her, and he may have acquiesced. Or, at the death of her husband, she may have gone to live with William’s guardian. John Shivers was born in Ireland about 1650, according to the reckoning of his descendants. He accompanied his parents to the New World on the RICHARD AND BENJAMIN. John would have been just under the age at which he could have chosen his own guardian when his father died, and of sufficient age to depart Virginia on or before his guardian’s death. John Shivers was one of the orphans mentioned after the death of Thomas Chevers who remained behind in Virginia at first, but upon achieving the age at which he could select his own guardian he moved first to Maryland, where he lived among the Quakers, and then to New Jersey where he settled and died, the ancestor of many of the family in New Jersey and Pennsylvania. "An Act for payment and assessing the Publick Charges of this Province. This would indicate that John had worked off or paid off his debt on time, according to the four year average for such indentures, providing Maurice Baker was only a little tardy in recording his demand. SHIVERS GENEALOGY further states that, according to one Ida E. [Shivers] La Grone of Shreveport, Louisiana, her father told her "he has been told all his life that there were two brothers that came to this country from Ireland. They became separated and one never knew what happened to the other one. "70 Ida was a descendant of William Shivers of Virginia, son of the immigrant. The probability is that when John left Virginia, he and William were the two brothers who shared the experience of cutting the gourds. William Chevers/Shivers is the first of Thomas’s children known to have been born in Virginia, with an estimated date of birth of April 1660. He was under age at his father’s death in 1664, and was a primary beneficiary of his father’s will, receiving the home plantation but no other land. Born in April, 1660, William remained under the guardianship of Robert Cartwright, and, following his death, was of age 14 or older in 1676, when he made choice of his own guardian - although he appears to have been assigned a guardian not of his original choosing, William Carpenter. He came of age in May, 1681. Shortly after that, he began selling off his land in parcels. By 1690 he was heavily in debt, and by 1695 was working his way back into property, so that by 1725 he was once again propertied - and probably financially wiser. He married Elizabeth, perhaps Crossland, and had at least one son, Thomas. It is not known for certain if he had any daughters, but it is possible there were two: Constance and Ann. Thus it would seem that there were other children who were under the care of Benjamin Harrison, a planter living in the upper end of Southwarke parish, Surry County,76 while Thomas was assigned to Richard Cartwright. In one of his first land transactions, William refers to his "sisters," which included Elizabeth and Petronella, as deceased - and may have included one or more other sisters. "Ralph Wormeley, Esqr., Secretary of Virginia, 13,500 acres, King and Queen County in Pamunkey Neck, 25 October 1695 . . .Importation of 270 persons: James Fleming, Patr. Fleming,...Tho: Greenwood, Moses Armitage, Wm Brewer, Jno Robert. . . .Wm Chevers..."
In 1717, William’s brother Thomas Shivers held land adjoining Thomas Lawrence, Mrs. Mary Baker, William Bryan and Thomas Page in the Upper Parish of Nansemond County.91 By 1730 this land was in the possession of William Shivers.92 Did he inherit it from his brother? Probably. "1725: William Shivers, by deed of gift, recorded in Nansemond county court, gave to his son Thomas Shivers, a parcel of land, lying at a place commonly called South Key, in the county of Nansemond aforesaid; being the land whereon the said Shivers now lives. "93 No wife is mentioned. 1. There was a William Chavis "free mulatto" listed in the 1728 sale of the Surry co. estate of Nathaniel Harrison. Thomas Shivers (son of William Shivers, grandson of Thomas Chevers/Chivers)96 was a neighbor of Nathaniel Harrison in the list of titheables for the upper precincts of Surry co. in 1701. 2. On the website The Shivers: A Work In Progress, there is a Bartholomew Chivers in 1770 Cravin Co. South Carolina court records and a Bartholomew Chivers/Shivers in the Revolution Troops Petition For Pay # 3767. Perhaps he was a Chivers named after Bartholomew Chavis(Chavers). 3. This is the best evidence that I have found. Elizabeth Chivers (daughter of Thomas Chevers/Chivers) had two sons named Gibson (Gibby) Gibson and Hubbard Gibson. Some Gibson researchers think that Gibby Gibson was the father of Gideon Gibson. Gideon Gibson was said to be of mixed race and lived in what was then (1720s) Chowan Co. North Carolina. 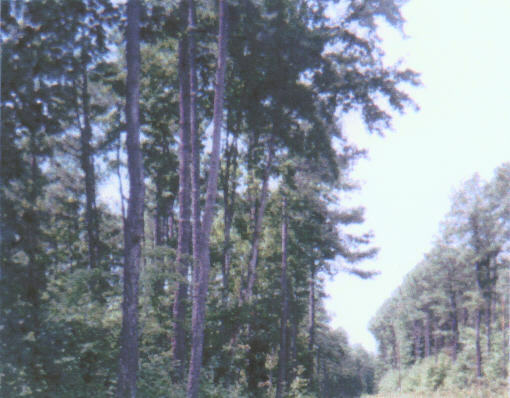 In the same part of Chowan Co.(north of the Roanoke River) lived my Chavis ancestors. There was a Hubbard Gibson (Gideon Gibsons uncle?) that lived in the same area of Chowan Co. NC in 1721. I think this was Elizabeth Chivers other son. This area later became part of Bertie Co. and then Northampton Co. NC. This Gibson family and some of my Chavis ancestors moved to the Pee Dee River area of South Carolina. 4. Thomas Chevers purchased 1,100 acres of land at the head of Sunken Marsh near Chippoakes in Surry Co. Virginia. In 1682, there was a William Sweat who was taxable in Thomas Binn's household in lower Chippoakes in Surry Co. Virginia. He was an ancestor of the tri-racial Sweats that married into my Chavis and Evans. Again, this is nothing solid but it is worth looking into and I will continue to do so. It is possible that my ancestors were Indians or mulattos that took the name of a white family. It is with the children of Thomas Chevers that the name in America began to be transmogrified into Shivers, by the grace of scribes in Maryland, Virginia and New Jersey. The children, beginning with Thomas the Younger, made their own way after leaving home, and did quite well for the most part. The youngest, William, left behind in Virginia, had it both easiest and toughest. Inheriting the Ralph Creed land, he lost it within 11 years of his assumption of it. Later generations, as they spread throughout the United States, did well. Marcus Shivers noted in his book that while some of the family went into Scotland in the 1860s - and then left that country - no one of the Shivers clan appears to have returned to Ireland. LANCASTER COUNTY COURT RECORDS Book 2, 1652-1657, f. 87. THE COMPLETE BOOK OF IMMIGRANTS 1607-1660; Peter Wilson Coldham; Genealogical Publishing Co., Inc.; Baltimore; 1987. ENGLISH ADVENTURERS AND IMMIGRANTS 1609-1660; Peter Wilson Coldham; Clearfield Co.; Baltimore; 1991. SURRY COUNTY RECORDS BOOK 1, 1652-1672, f. 127 and f 377. THE COMPLETE BOOK OF IMMIGRANTS; op. Cit. LANCASTER COUNTY COURT RECORDS 1652-1657 op. Cit. and OLD RAPPAHANNOCK COUNTY COURT RECORDS, op. Cit. LORD MAYOR'S COURT OF LONDON, Depositions Relating to Americans 1641-1736; Peter Wilson Coldham; National Genealogical Society; Washington, D.C.; 1980. LORD MAYOR'S COURT OF LONDON, Depositions Relating to Americans; op. Cit. CHEVERS FAMILY CORRESPONDENCE; Nathan A. D. Miller; letter from Michael John Joseph Chevers to Nathan A. D. Miller. FUNERAL ENTRIES Vols. 1 & 2; Genealogical Office of Dublin. CHEVERS OF KILLYAN; Fredericka Sophia Chevers; privately printed; Jacobean House, Capel-le-Ferne, Kent, England; October 1936. CHEVERS FAMILY CORRESPONDENCE; Nathan A. D. Miller; Letter from Jane Maxwell, Assistant Librarian [College Archives], Manuscripts Department, Trinity College Library, Dublin, Ireland; 26 May 1995. HELL OR CONNAUGHT; Peter Beresford Ellis; St. Martin's Press; New York; 1975. THE IRISH AND ANGLO-IRISH LANDED GENTRY WHEN CROMWELL CAME TO IRELAND; John O'Hart; M. H. Gill & Son; Dublin, Ireland; 1884. THE WORLD WIDE ILLUSTRATED ENCYCLOPEDIA, Vol. 1; C. Ralph Taylor, et al. ; Blue Ribbon Books; New York; 1935. CLAREMONT MANOR: A HISTORY; Eve S. Gregory; Plummer Printing Company, Inc.; Petersburg, Virginia; 1990. Land patent for John Homewood. SIDELIGHTS ON MARYLAND HISTORY: Baltimore and Anne Arundel Counties; Homewood Range, patented July 5, 1670 for John Homewood. INVENTORIES AND ACCOUNTS OF MARYLAND; estate appraisal of Edward Marshall, Anne Arundel County, Nov 30 1690, sureties: James Peasly, James Homewood. SURRY COUNTY [VA] DEEDS, WILLS Liber 4 1687-1694; f. 254; William and Elizabeth Chivers to Benjamin Harrison. ANNE ARUNDEL LAND RECORDS BOOK WT #1; f. 207. ISLE OF WIGHT DEED BOOK A ff 77-78. CHEVERS OF KILLYAN; op. Cit. SURRY COUNTY [VA] DEEDS AND WILLS, Liber 4, 1687-1694; f. 254 op. Cit. MARYLAND PATENTS, LIBER I, f. 383. Warrant to Benjamin Rozer dated June 1,1663. MARYLAND PATENTS, LIBER F, f. 538, Warrant to Edward Dorsey dated 1667. MARYLAND PATENTS, May 8, 1675, Warrant to Maurice Baker of Anne Arundel County. SURRY COUNTY RECORDS, BOOK III; 1672- JAN. 1682; f. 127. SHIVERS GENEALOGY; Marcus O. Shivers; The Deseret News Press; Salt Lake City, Utah; 1950. See forward in this section. MARYLAND ARCHIVES, VOL. 1; f. 498. HENING'S STATUTES AT LARGE, LAWS OF VIRGINIA, VOL. IV; Chapter XVII, page 526. CAVALIERS AND PIONEERS; VIRGINIA PATENT BOOK NOs. 10 and 14. OLD RAPPAHANNOCK COUNTY ORDERS 1683-1685; f.63. RENT ROLLS OF ANNE ARUNDEL COUNTY: op. Cit. VIRGINIA WILL RECORDS; Indexed by Judith McGhan; Genealogical Publishing Co., Inc.; Baltimore, MD; 1993. HISTORY OF CALVERT COUNTY; C. F. Stein; Published by the Author in cooperation with the Calvert County Historical Society; Baltimore MD; 1960. MARYLAND ACCOUNTS, Calvert County, Maryland. Book 1, f. 54. SURRY COUNTY TITHEABLES 1680; 1681, 1682. SURRY COUNTY RECORDS, BOOK II 1671-1684; f. 297. PATENTS AND DEEDS AND OTHER EARLY RECORDS OF NEW JERSEY 1664-1703; ed. by William Nelson; Genealogical Publishing Co., Inc.; Baltimore MD; 1976. P. 663. SURRY COUNTY COURT RECORDS, 1672-JAN. 1682, BOOK III; f.122. SURRY COUNTY TITHEABLES 1674 and 1677. SURRY COUNTY TITHEABLES 1679, 1680. SURRY COUNTY RECORDS, BOOK III, 1671-1684; f. 338. SURRY COUNTY RECORDS, BOOK II 1671-1684; f. 310. Ibid. ff. 330, 342, 343. Ibid. f. 766 et seq. HENING'S STATUTES, VOL. IV F. 529. CHEVERS FAMILY CORRESPONDENCE; email from Kenny Shavers dated October 13, 2000, in the possession of the author.